Obituary – Rolling, Robert Eugene « Perry High School Alumni Association, Inc.
F.F.A. 55-58; Assemblies 55-56, 57-58. Robert Eugene Rolling went to be with the Lord on October 3, 2011. He was born November 3, 1940 in Red Rock, OK to Leo and Hazel Rolling. 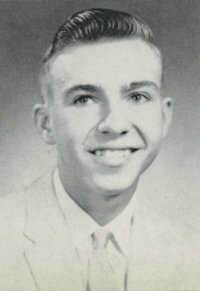 Robert was a graduate of Perry High School where he was active in the 4-H Club and Future Farmers of America. After high school, he graduated OSU where he was a member of the Flying Aggies and was soon drafted into the U.S. Army. Robert became a Commercial Pilot and found great joy in flying. He was active in Boy Scouts as a Scout Master and was selected a member of the Order of the Arrow. He was also the Alumni Treasurer for Girl Scouts. Robert worked as an Electronics Technician for FAA (41 years) and served as Branch Manager. Robert was a devoted Catholic as well as a 4th Degree Knight of Columbus. Among all these things, his hobbies were fishing, traveling, gambling and tinkering with projects. He will be greatly missed by all who knew and loved him. His survivors include his wife, Barbara L. Rolling; children, Robert A. Rolling and wife Christina, Deborah L. West and husband Martin and Mark A. Rolling and wife Michelle; sister, Janice Fiester and husband Richard; grandchildren, Eric A. Rolling, Ashleigh A. Rolling, Brandy M. Rolling, Johnathon L. Rolling, Victoria B. Rolling, Paige E. West, Emily B. West, Alexandria R. Rolling, Rylee A. Rolling; aunt, Delores Schwartz; and numerous nieces, nephews, cousins and friends. In lieu of flowers, donations may be made to: Rosary School, c/o St. Francis of Assisi Catholic Church, 1901 NW 18th, OKC, OK 73106. Visitation will be held from 9-6 on Thursday, October 6, 2011, at Smith & Kernke with Wake Services following at 7:30p.m at St. Francis of Assisi Catholic Church. The Mass of Christian Burial will be held at 10 a.m on Friday, October 7, 2011, at St. Francis of Assisi Catholic Church. Interment will follow at Resurrection Cemetery.